I'm trying to use the raspberry pi as a set top box to watch UK DVB transmissions (freeview). 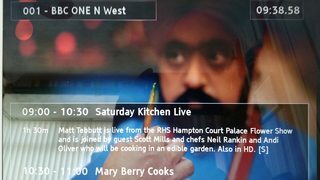 I have one pi setup as a server with TVheadend, this works fine, I can view tv really smoothly on any of my xbmc boxes, xbmcbuntu, samsung galaxy tablet etc around the house. I have bought the MPEG-2 codec licence, but openelec and raspbmc are just too slow and buggy. 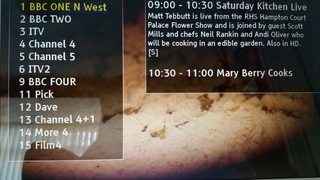 I have managed to find PIDVBIP, a simple client for just connecting to tvheadend and playing the tv stream. This runs a lot smoother. Is there a better solution out there, that I may have overlooked? My current challenge is to have this controlled by IR remote control, will post separately about that. I'm using mumudvb for both dvb-t and dvb-s in unicast http mode. Works very well with omxplayer(GUI) for SD and HD. Server and player can run on the same RPi, as long as you do not serve more than 4 channels (from one frequency/transponder) at the same time. But it requires more manual work to do (creating config files for each channel etc.). I control everything from a web interface. Sorry I cannot help with your query, but I am looking at a tv headend and i wondered if you could advise me on your choice of pi compatible tuner. Don't think it can cope with HD transmissions, but it works fine with the MPEG-2 stuff. Thanks for that, I followed the link and Amazon offer an HD version T210 which looks very interesting. Also could usefully add libavformat-dev to the list of pre-req packages for a clean build on a stock Raspian Lite install.